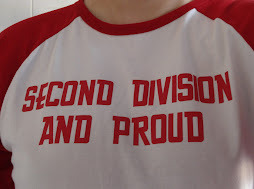 Second Division And Proud: SIT UP !!! Say it quietly but things are changing. With no disrespect to our US bloggers I’m not talking about the new POTUS / LOTFW (still TBC as I write sitting up [drinking and] watching auntie’s coverage) but about the REDVOLUTION agenda. Now I know Pedro45 will again say that we need to get our mission statement right first but I take some solace (quantum of ? ;-) in the fact that the world is listening to the published manifesto already! Even this Arabian site list the c word in brackets and refer to us as a SECOND DIVISON (AND PROUD) CLUB !!! With this success I’m afraid I can’t stand still (thanks for the support for the Junior Reds Kings Hill Addick) but that's because I've been drinking Guinness for the last x hours - come on, you must have ideas to add ?? Welcome TJSE7 (as I know him) to the world of the might boosh ... sorry blog! I am bang on this one with you. I'm Charlton through and through and really enjoyed supporting Charlton throughout the third division promotion campaign, subsequent second division relegation battles, the lofty height of the first division, back in the day's when there was actually at least one different club in the top four each season. (In fact back then the top four was completely irrelivant. Top meant you got to play in the European Cup along with Europes other Champions. (Only one from each country, not like that horrible 'champions' league - why do they sing 'Lasagne' on the sponsered ad break bit ? If you weren't crowned champions the top seven still had the chance to chase a coveted UEFA cup place. The FA Cup was a prestigous competition, just as important and holding the same kudos as winning the league. There was highlights on a Saturday and Sunday (and back then ITV did it actually quite well). Midweek sports special, Oh and The Evening Standard Five A Side tournemant. Class. The Poomiership, with it's Monopoly's. The Chamionship Fizzy Pop and the League just do not measure up to the way thing's used to be able to inspire. Gone off on one there, aopolgies. Perhaps we can emulate my original Valley heroes and win the third division next year ?